Spaghettieis is a fun ice cream sundae created by Dario Fontanella, son of an Italian immigrant and owner of an ice cream parlor in Mannheim, Germany, in 1969. It has been a German specialty since then but is virtually never seen outside of Germany. The original method called for pressing vanilla ice cream through a spaetzle press, but it's unlikely you'll find one in the U.S. Using a potato ricer is an alternative method. 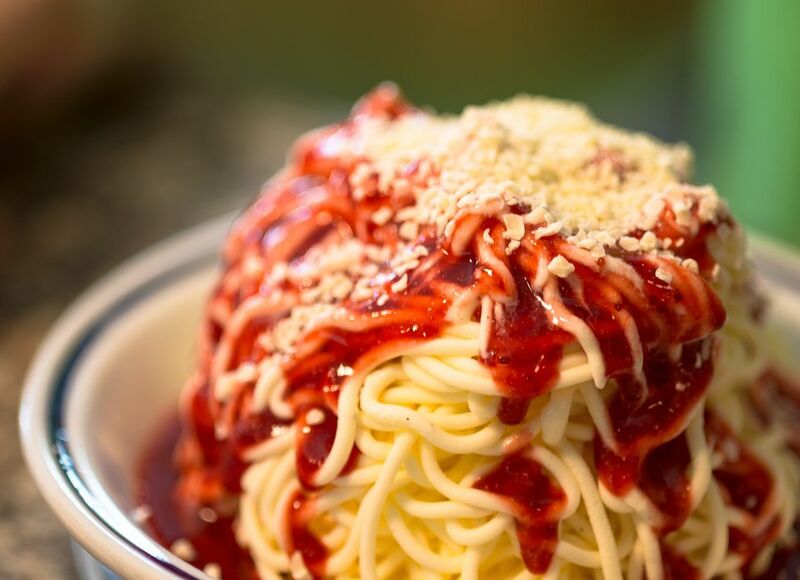 Pressing ice cream through a potato ricer creates "noodles," strawberry sauce looks like tomato sauce, and coconut or white chocolate shavings play the Parmesan cheese role. Cut the strawberries in half or quarters, and place them in a blender. Add the orange juice and 2 tablespoons sugar, and blend until smooth. Add a little more juice or sugar to taste, if needed. Refrigerate until very cold, or up to one day. Whip the cold whipping cream until soft peaks form. Add sugar to taste, and beat until stiff. Place a dollop of whipped cream onto each plate or sundae cup. Use an extra plate to hold the ​potato ricer, and scoop about 1 cup of ice cream into it. Holding the ricer over the sundae plate, squeeze the ice cream through the holes, and swirl it onto the plate, over the whipped cream. Repeat for the other plates. Pour the strawberry sauce over each ice cream "noodle" creation, and sprinkle with shaved, white chocolate, or coconut shreds. Creamier ice cream makes better-shaped "noodles." In Germany, vanilla gelato would be used. Buy the best quality ice cream you can find, or buy gelato, if that's possible. The whipped cream freezes a little under the ice cream and makes a crackly crust, which some people really like, but you can omit the whipped cream if you wish. You can use bottled strawberry sauce. If you want to make this sundae even more elaborate, add chocolate "meatballs." You could use homemade truffles or malted milk balls to fill this role in a spaghetti and meatballs sundae. Serve with shortbread, white chocolate chip, or sugar cookies to mimic Italian bread.